MOLDED RUBBER includes molded shapes of rubber and elastomers for a variety of products. Examples of molded rubber products are gaskets, seals, o-rings, spacers, bumpers, shock absorbers, electrical mounts, anti-vibration mounts, and plugs. Injection molding pushes (“injects”) the molten raw rubber material by high pressure into a shaped mold cavity, where it would then cure and take on the shape of its mold. Compression molding takes the preheated raw rubber material into an open mold cavity, which is itself under heat. The mold cavity is then closed at the top, where the constant heat and pressure cures the material into its mold shape. Transfer molding uses high pressure to feed the raw rubber material through channels into the enclosed mold cavity, where it is heated and cured into the mold shape. Rubber is bonded to metal, in which the metal inserts are coated with a heat activated adhesive then placed in the mold cavity where the normal rubber molding process takes place. The adhesive is activated during the molding process, allowing the metal inserts to be bonded to the rubber. 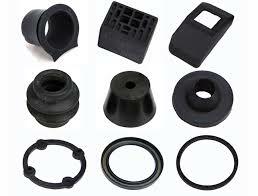 Coi Rubber is a supplier of custom molded rubber parts and products. Coi Rubber Products is able to manufacture molded rubber products to your exact specification guaranteed! We are able to provide molded rubber for industrial products, automotive components, agriculture products, appliances, and more. Have questions? Please fill out the form below to receive information regarding your inquiry. You can also give us a call at (626) 965-9966.